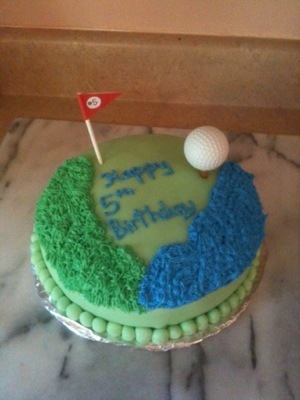 Well the 5th birthday party at Willowbrook Golf Center was a success! Perfect weather, the kids had a blast, although the first five minutes of chaos was a little overwhelming. 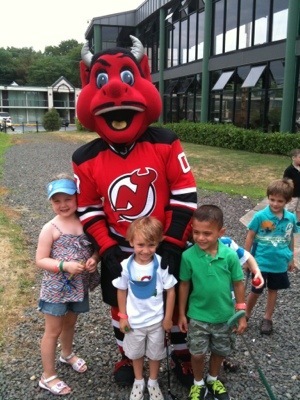 The mystery guest, the NJ Devil was a hit! 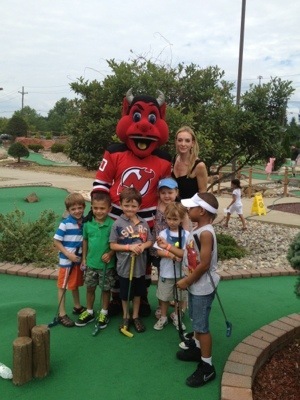 Some of the boys from Cael’s hockey team were there and they all loved it. 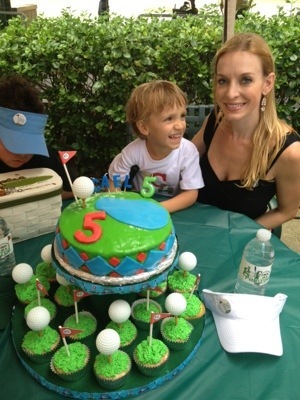 And even my cake was a hit. Phew, all the work is over…until next year! 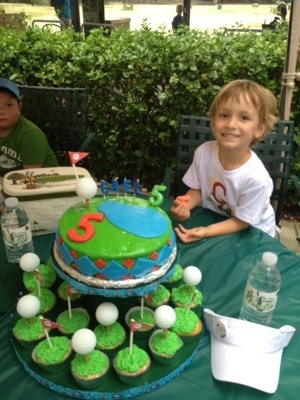 So I’ve been planning Cael’s 5th birthday. 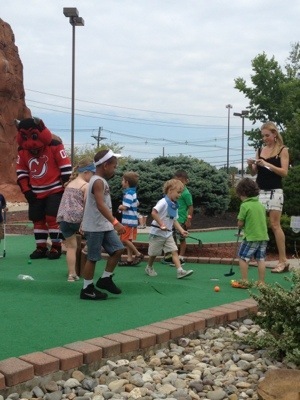 It’s going to be at a local mini-golf place. I’ve been on Etsy and EBay buying stuff for the party for the last month. I’ve invited about 35 kids, of which I anticipate about 24 to attend. It’s always hard with summer vacations and so many other things going on to get a convenient date for people. I have coordinated the outfits, purchased the balloons, next big item was the cake. I was originally going to budget up to $200 for a cake but decided I could attempt to make it myself for a big cost savings that could be budgeted elsewhere, like favors or a photographer. 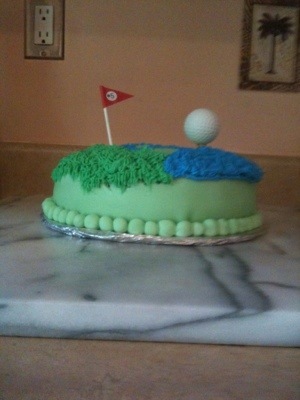 I spent at lest two weeks googling golf cake images and “how tos” for cakes, watched YouTube videos etc. Finally I decided on a simple design. 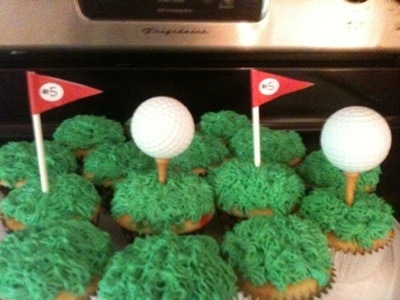 I made the cake/cupcake toppers myself. After free printable flag numbers and the tees, sticks and balls I got on eBay I definitely spent about half of the amount it would have been to buy the items. With just a little hot glue and Elmer’s glue I was ready. Next up, icing supplies. 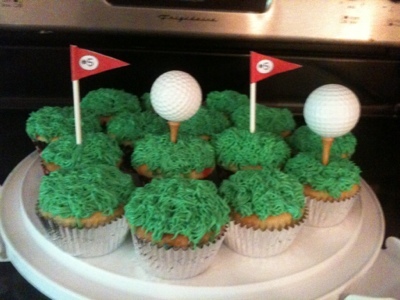 I googled how to make grass icing. 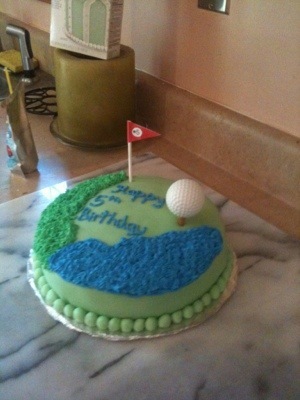 I went to Michael’s and got my Wilton tips and icing bags, and some green Wilton fondant and was ready to go. Next up the trial cake. Next up, the cake/cupcake stand!! Still working that one. 6 days to go, it’s crunch time! I have a coworker who a few months ago (early July) mentioned they were going to enter a 10k. Next thing I knew my untrained, hadn’t run a mile in more than nine months self, agreed to do the same. I guess it was some inner competitiveness and not wanting to accept the fact that a peer could accomplish a feat of physical fitness that I could not as well. But really, what was I thinking?! For purposes of full disclosure I work out a good deal, I lift weights and may do 20 minutes on the bike at a time. However, neither of these provide you with the cardiovascular endurance needed for running. My self-proclaimed physically fit self soon realized this. I quickly jumped in with two feet because I had 2 months to do a 10k! 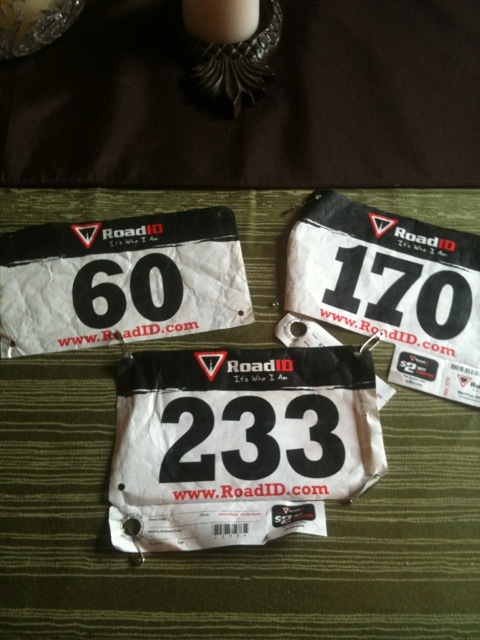 I first signed up for every local race I could find. One, than another, than another…. And after becoming slightly addicted I think there may be more. And it’s a great way to teach your kids about fitness. Cael loves going to the races too! When I got to the first race I was a little intimidated by the “real runners” in their running gear and running club and track team jerseys…but I was determined (although a little scared) to hold my own. Once one race ends I get so excited for the next one. There’s nothing like setting a goal and trying to accomplish it to make you feel on top of the world! 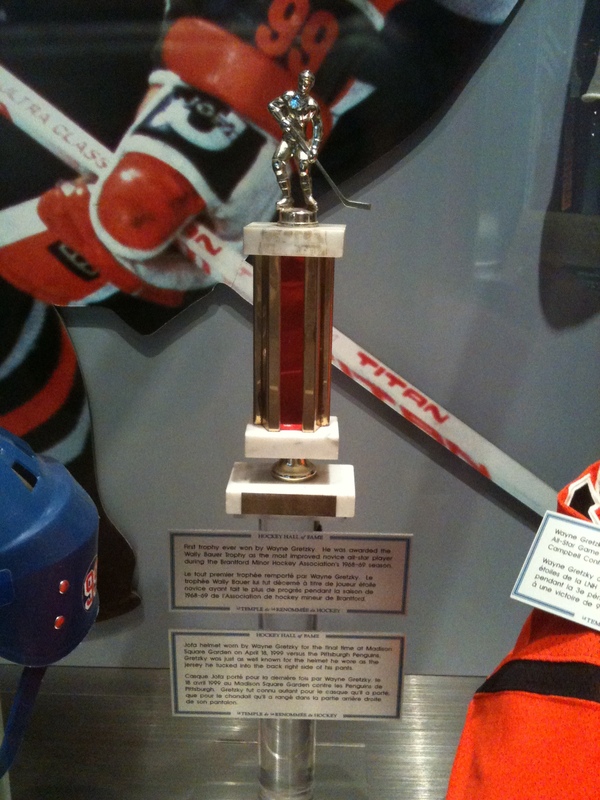 Toronto and the Hockey Hall of Fame! Little did I know in going to Canada (Toronto to be more specific) for Forth of July, that July 3rd is Canada Day! Not only might it be the most un-American thing to do for the 4th but its a VERY BAD idea to drive somewhere that far on a holiday weekend! Granted, in taking an hour to drive one mile past Niagara Falls I did realize that it is absolutely beautiful and somewhere I want to go again, but next time I will fly! Once in Toronto I realized the city is HUGE and very spread out. 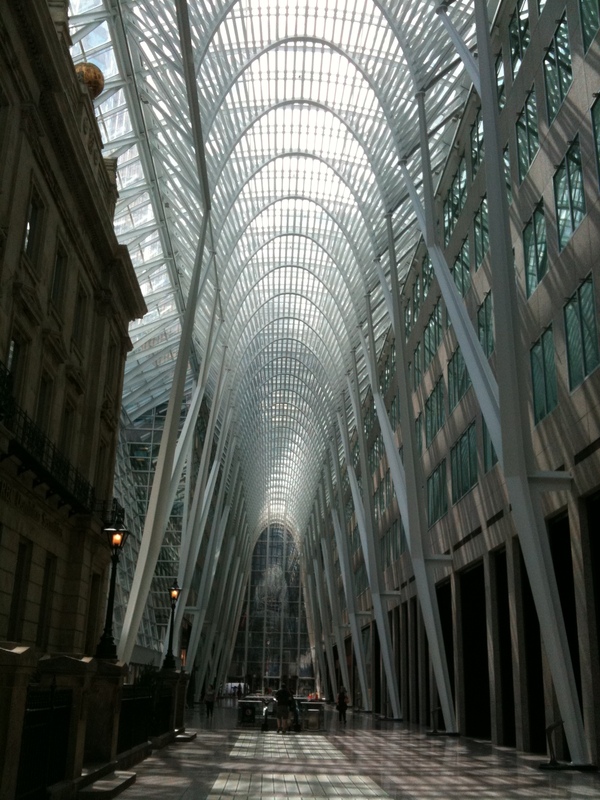 Toronto has major sports teams, concert venues and is home of the Toronto Film Festival. Of course now I forget who it was, I want to say Brittney Spears and Black Eyed Peas but could be wrong, both had concerts the week I was in Toronto. As far as sports go the Blue Jays were Playing the Phillies and I was very close to just buying tickets on the street to go to the game, since it was such a gorgeous day to sit outside, and then reminded myself that I am not a Philies fan, or a Blue Jays fan. 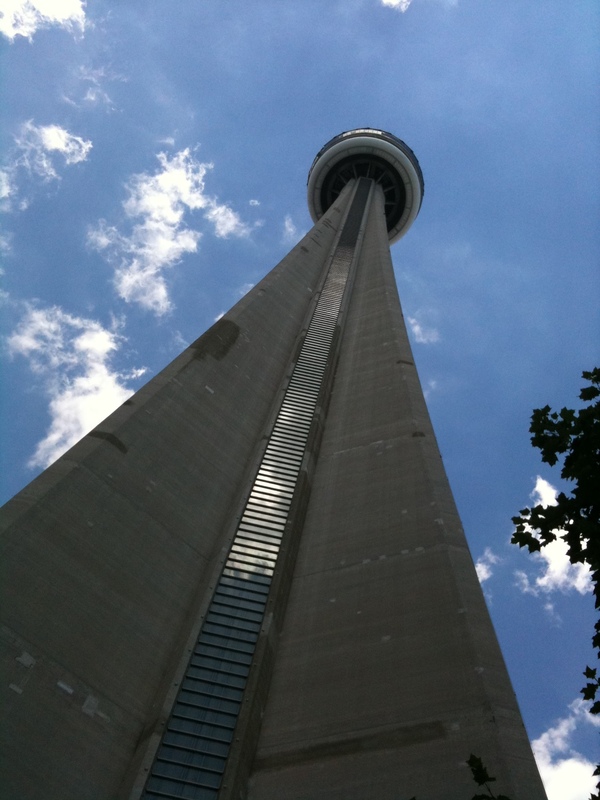 Instead I decided to go to the CN Tower (above) on of the tallest buildings in the world which actually dwarfs the Empire State Building. After paying an excessive price (Canadian-the exchange rate is close but some places charge you up to an additional 10% for using American dollars! Gurr…) I got the privilege to stand on line with a lot of people cram into an elevator and shoot to the top of a very large building in a matter of seconds. Not gonna lie, it was pretty cool. 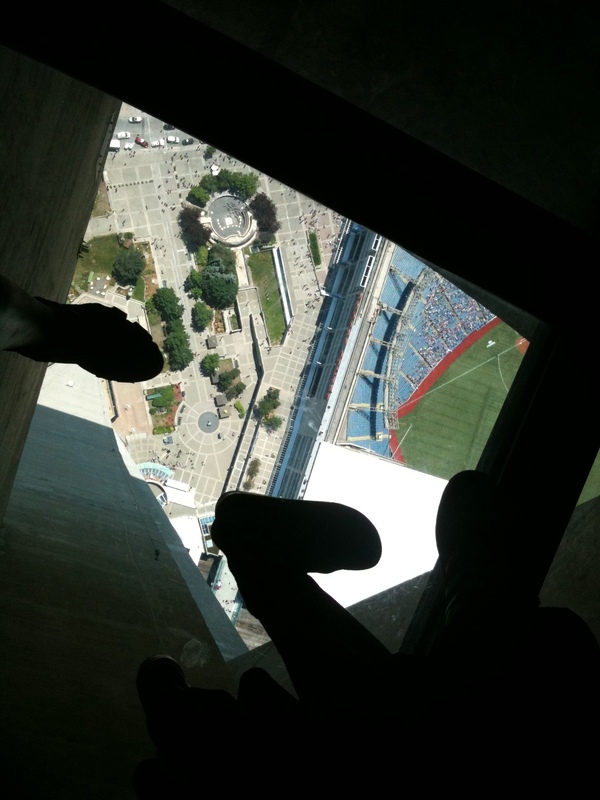 The elevator has a window to outside and the tower is right above the Blue Jays stadium. You could see the stadium directly under you getting smaller and smaller by the second. 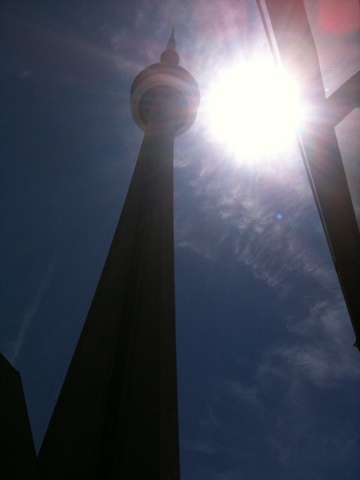 Once atop the CN Tower was pretty cool also. I have no fear of heights (and have jumped out of a perfectly good plane before) but there is a glass floor that you can stand on and look down below and even I started to feel a little dizzy. Mind you not fearful, but definitely dizzy. When going outside onto the observation deck you have the most amazing view! Unfortunately of a body of water which is escaping my recollection right now, along with some beautiful small islands, names of which are also escaping my recollection right now. After getting the amazing views from the top of the tower I went to see what else I got with my all access pass. I watched a really cool 3D movie about surfing (on some island I forget the name) of the largest wave in the world that all the big time surfers go to ride (I’m going to have to google that again later also). I know nothing about surfing but the main character was Kelly Slater (kind of makes me think of Saved by the Bell) who apparently is this big time, 10x, world champion. Not to mention the fact that he has dated the likes of Pamela Anderson, Cameron Diaz and some other people I forget. Lets just say he’s good-looking, his surfing is amazing and I really want to go to that island, even though I forgot the name. Lol. Next up was the simulated roller coaster ride, also 3D. You remained seated the whole time but watched a video on the screen in front of you, while your chair was going nuts, so you actually did feel like you were dropping 100 feet down a waterfall at times. The water being splashed in your face helped with the effects. Next up was the gift shop where I spent entirely too much money on my son and nephews. Although my son got a really cute CN Tower jersey. .
Next onto the HOCKEY HALL OF FAME! 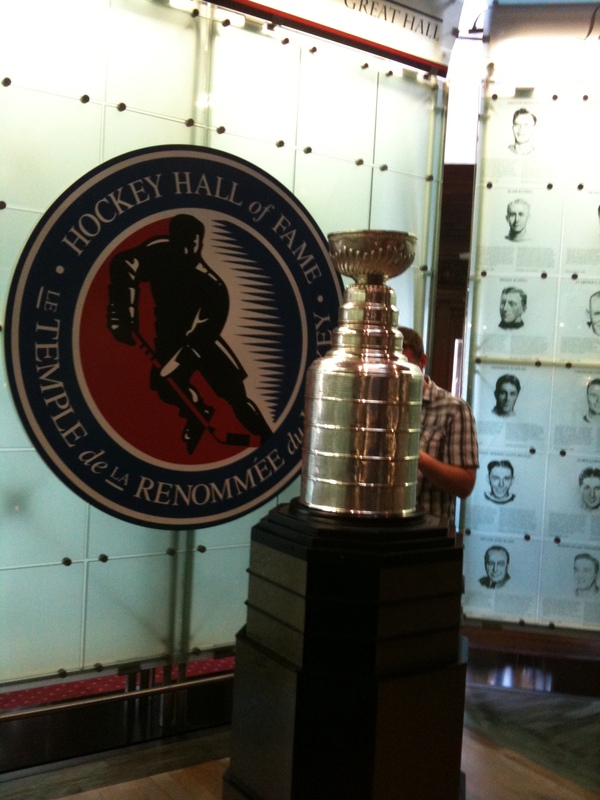 After like a crazy tourist trying to find it I finally arrived at the Hall of Fame. Well actually the gift shop first, where I spent an extensive time browsing and of course made more purchases. Since I am a Devils fan I had to buy a Devils necklace but obviously quickly realized that was silly since I had just been to the Devils Den (team store in Newark) the week before and could have obviously bought the same thing there, but of course my impulsive spending is tenfold on vacation. Since the CN Tower jersey was not enough I had to buy my son a Toronto Maple Leaves shirt…since I at least needed something that said Toronto. Down in the Hall of Fame, which is actually in the basement of the building, I felt almost like I . was transported to 50 years earlier. Lets just say I had no big interest in hockey, until my 2-year-old son became strangely obsessed, but now I have a huge appreciation for the sport. In fact probably would not even know of some of the greats that existed, Gordie Howe, Bobby Hull, but for the fact that my son has every children’s hockey book ever written so I’ve read about them all. 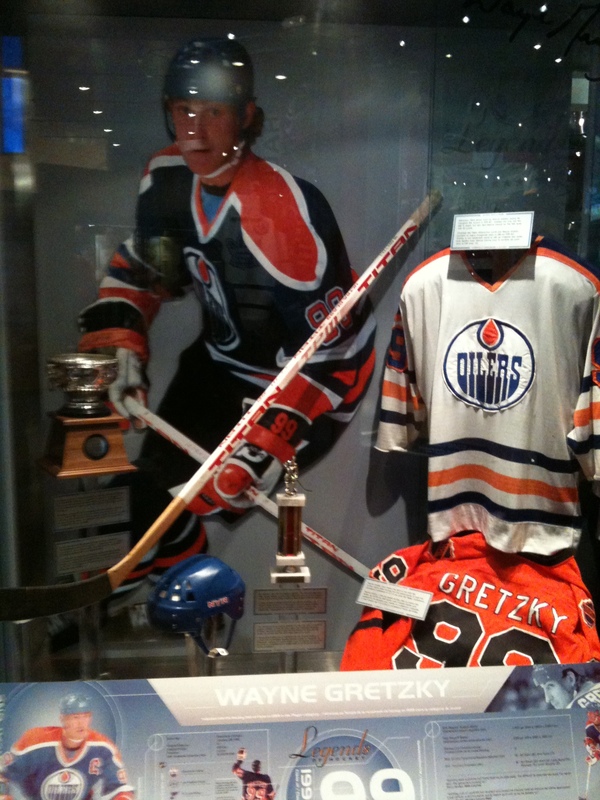 And of course the great Wayne Gretzky was a Ranger so we know who he is. I am a very sensitive person, and call me crazy, while I was going through the Hall of Fame I was actually getting choked up!! On several occasions I was overwhelmed by just thinking of the greatness that exists in the world and the amazingness of people’s accomplishments that I was so impressed and overwhelmed at the same time! 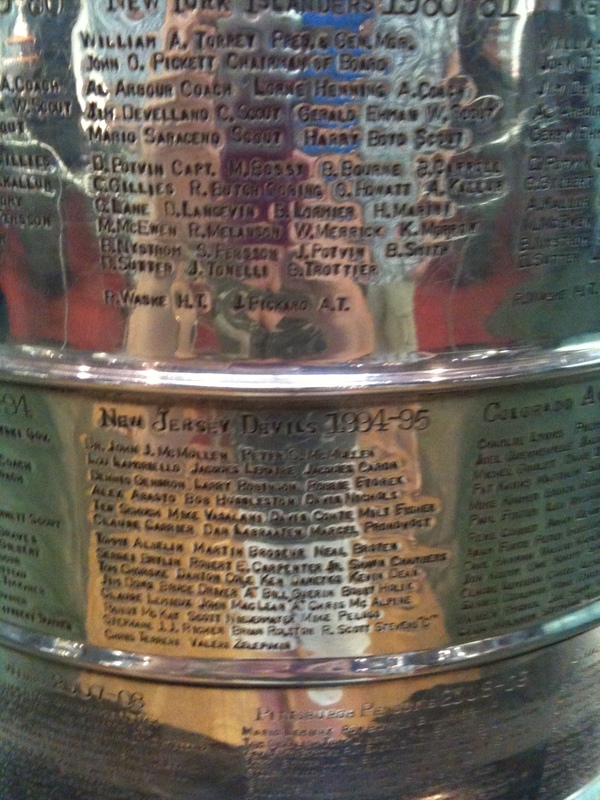 Of course some of my favorite parts had to deal with my Devils 3 Stanley cup championships and the Big USA Olympic Win!!! 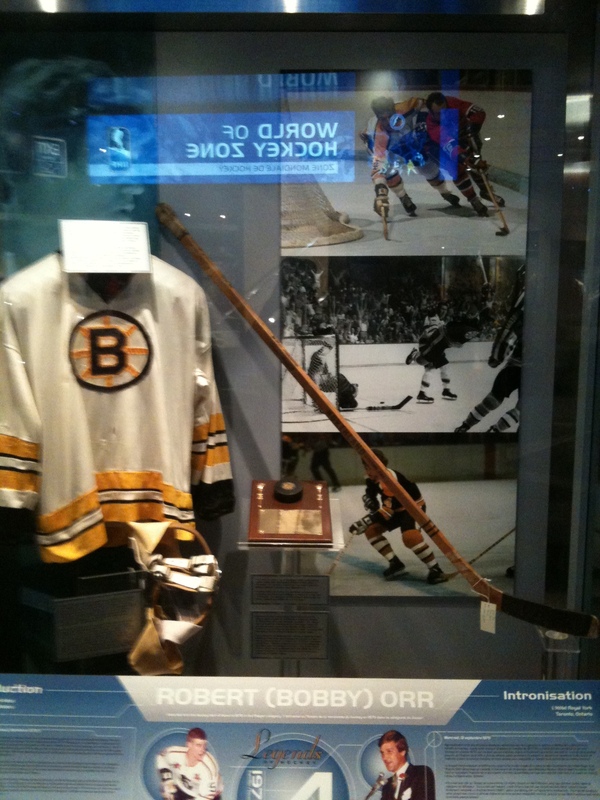 Unfortunately it was within the 100 some days after the Bruins had won the cup so the “actual” Stanley Cup was not there, but a exact replica stand in was to get pictures taken with. 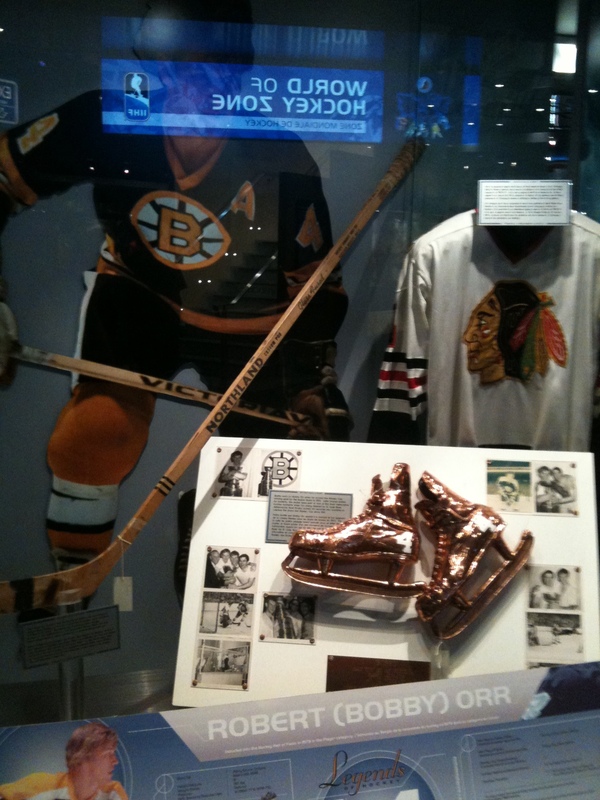 I have to say, it is AMAZING to see the old school skates, padding, jerseys, that were worn back in the day! 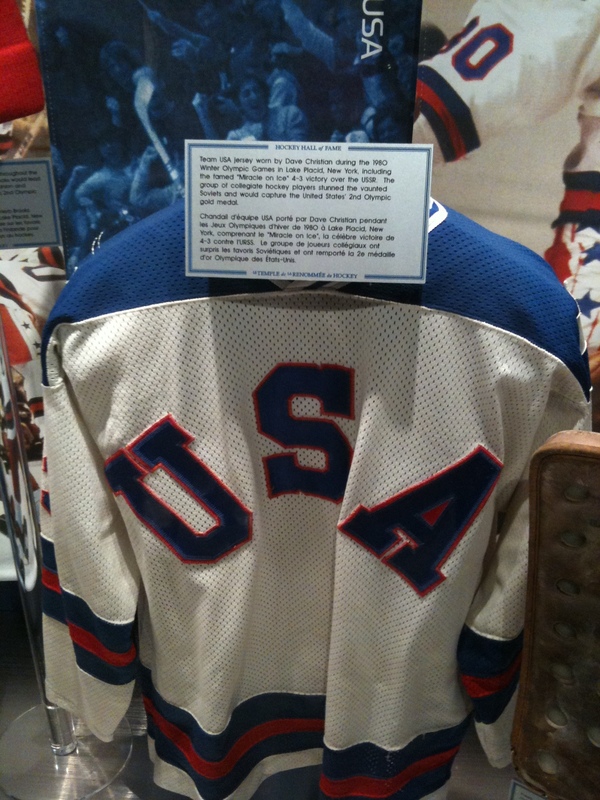 All leather and wool, nothing compared to the Bauer, CCM of today. The helmets had no face masks and the face masks had to helmets! 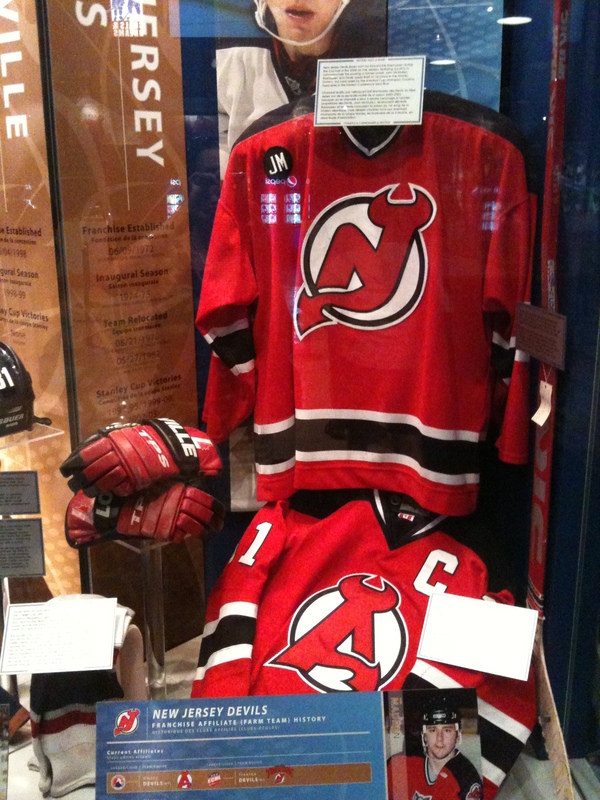 I’d cant imaging that anyone had the special gel shock protector mouth guards…. Anyway…I will Definately be going back to the Hall of Fame! I don’t play hockey, never had any interest in hockey till recently, and I was sooo impressed and so touched by the emotions of being in that building. As always my son asked me as soon as I got in the door “what’d you get me” He was very happy with his souvenirs but I think he was most happy with the promise that he will go next time. The first thing that popped into my head this morning after I left the gym…because after a good workout is when my I really get pumped up about EVERYTHING…If you dream it you can be it, if you reach for it you can touch it, if you think it you can become it. It’s so true, and my mantra for the day that I will tell anyone who wants to, or even doesn’t want to, listen. Everyday I have my son repeat after me, “I am a superstar. I am a campion,” then he gives me five. It’s the little reminder/positive affirmation that he can do anything and that he can become anything. 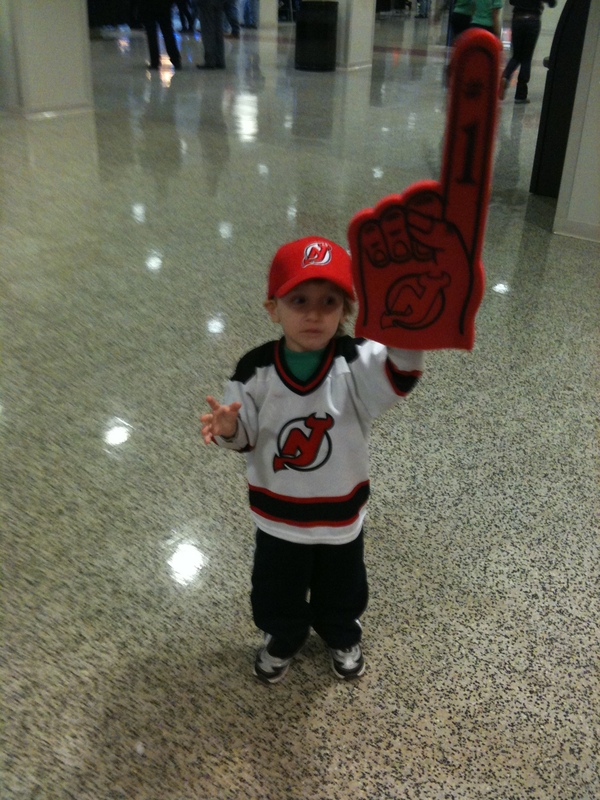 My son LOVES hockey. I do not know where the obsession (versus just like) came from. 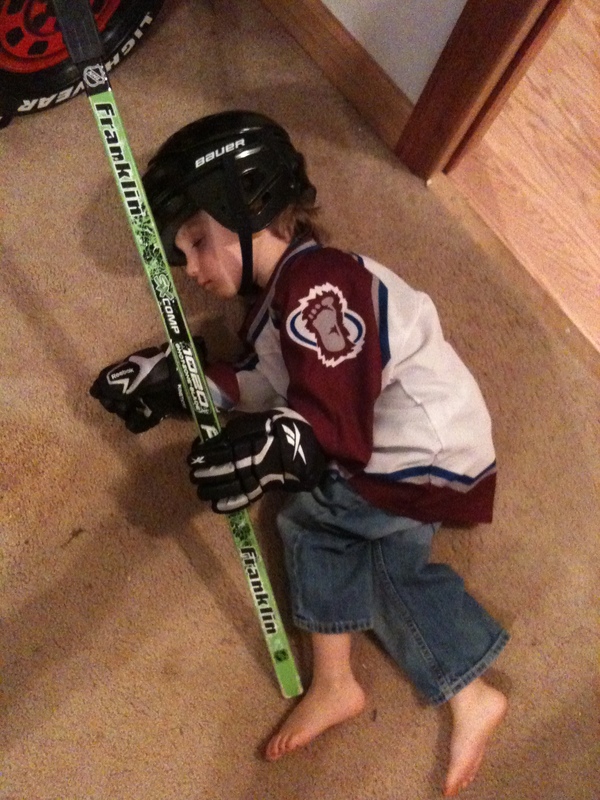 Sure he watched hockey with his dad but it went from all Dora all the time to all hockey all the time. Once the playoffs came around last year I knew I would soon be in trouble. That God for DVRs because suddenly we were watching the same games, over, and over, and over again, all summer long. I finally got start and started ordering DVDs, “NHL’s Greatest Goals,” “NHL Behind the Scenes” and every children’s hockey book ever written, “Z is for Zamboni,” isn’t that on everyone’s bookshelf? We have hockey sticks (many), hockey pucks (many), hockey nets (many) hockey jerseys (many) and hockey cards, literally all over the house, car, and it goes on everywhere you look. The boy loves hockey, and I’m not going to lie, mom likes it better than Dora. 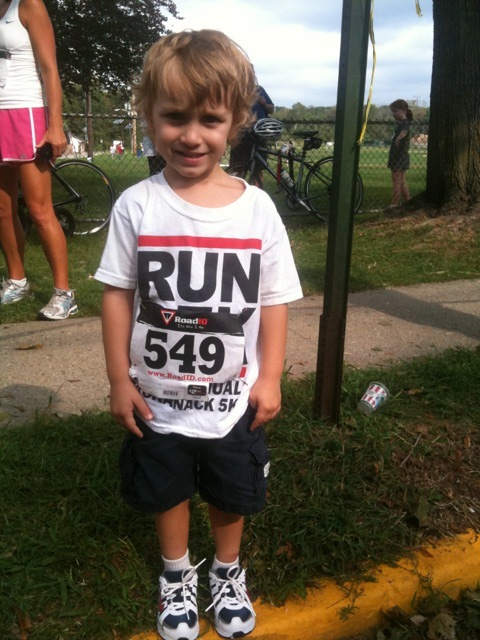 The purpose of this blog is not to talk about my kid (even if he is the cutest 3 year old ever) but to talk about passion and unbridled enthusiasm. I am my son’s cheerleader, supporter, motivator, because I believe in him just like I believe in myself or anyone else for that matter. We live in the United States of America, the land of opportunity. Where you can come from nothing and have everything…as long as you want it enough. 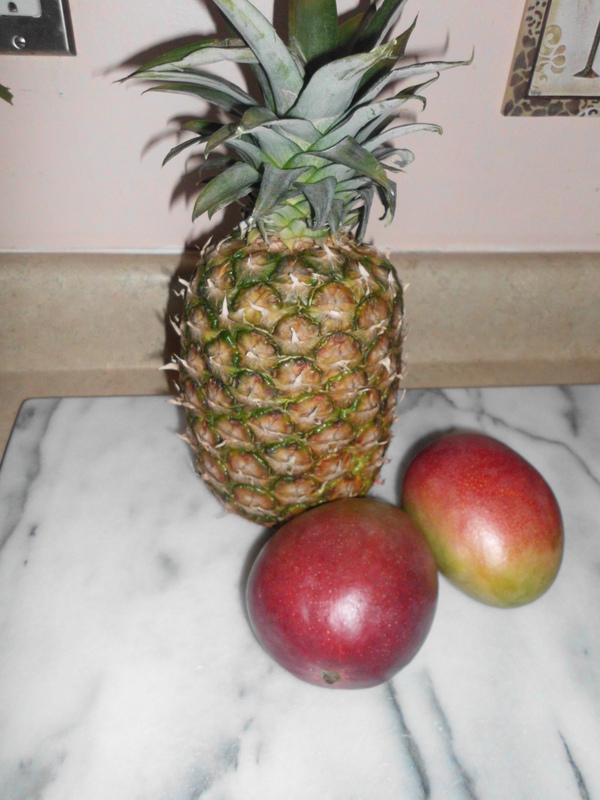 So while I love all fruit, two of my top favorites are mangos and pineapple (I’m a sucker for anything tropical). I think it may have something to with the fact they take for ever to cut that I feel like I must be getting something good once it’s peeled and sliced and ready to eat. Well, not only did I buy a pineapple this week but I bought six mangos. I have always been one to buy ingredients first then find a recipe to fit them later, I know most people work the other way around. Next, I bought some mint and cilantro plants while I was buying some plants for outside and seeds to make a garden. 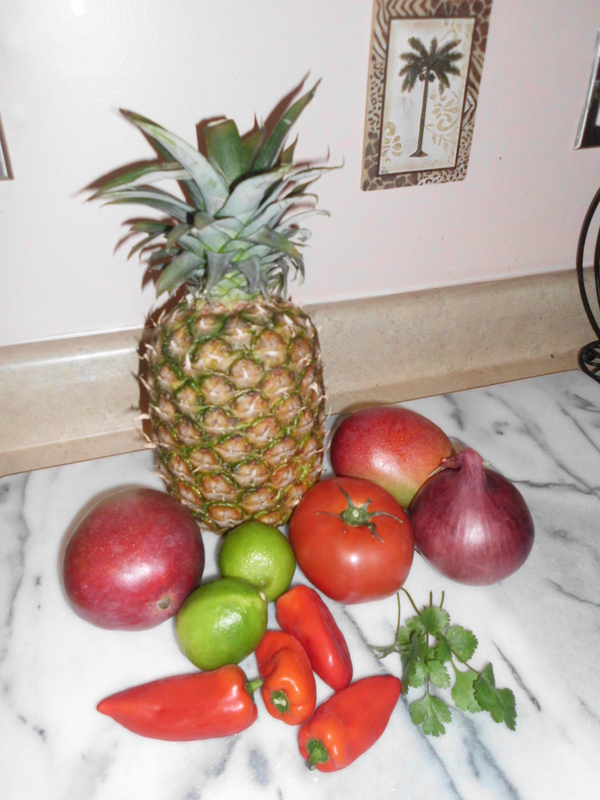 Hummm, what does one do with pineapple, mango, mint and cilantro….ahhh, salsa of course! 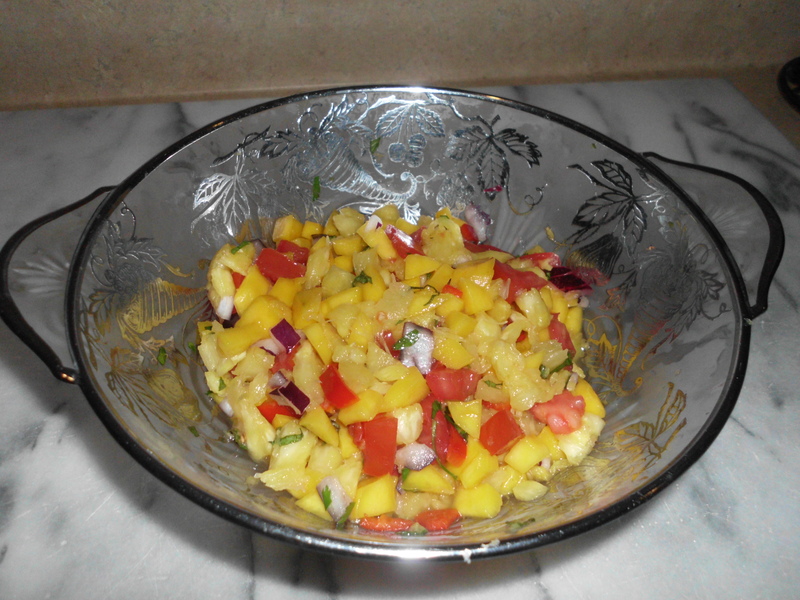 Next was scouring the internet for the perfect pineapple mango salsa. As always, I gather no less than three recipes, I scan them and then use only the ingredients I like, in the ratio I like, to make the recipe MY own. This is what I came up with. *I omitted jalapeno peppers, you could add one if you wish. You could also substitute some of the lime juice for lemon juice. If you don’t want to use red onion you can use green onion. You can add some salt and pepper as well if you like. I am the queen of substitutions and hardly ever follow a recipe exactly, always modifying it to what I like. 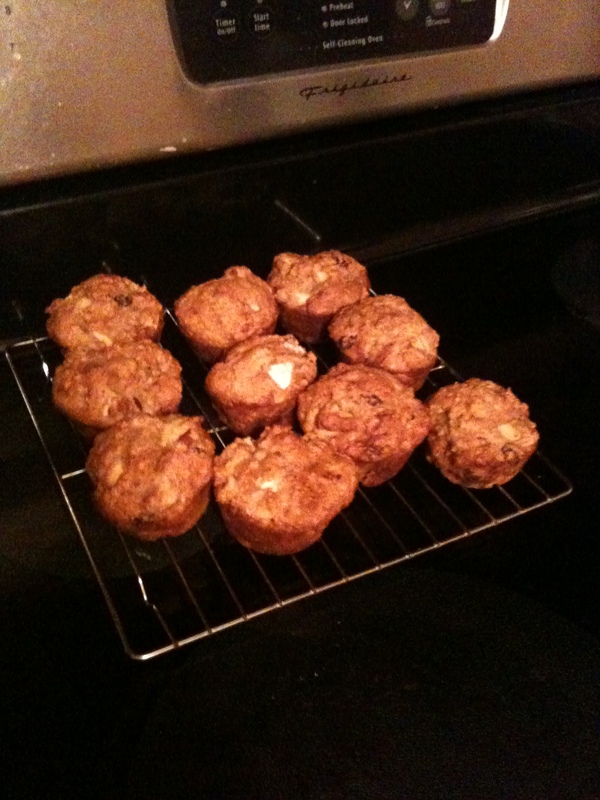 Whole Wheat Apple Raisin Muffins…my first experiment with agave. I have always been a sugar substitute person since I started using Sweet N Low (YUCK) in my coffee about 15 years ago, then it was equal, then it was Splenda, then it was Truvia…. You constantly hear about the potential negative consequences of these substances. I thought I was doing better with the Splenda and Truvia, but alas, there are always the negative comments about possible health risks. Since I have no desire to start doing my baking with cups and cups full of sugar I am very glad to start using Organic Blue Agave as an alternative. I NEVER use a recipe exactly as I find it. There are always ingredients I don’t want to use (think white flour or walnuts) or ingredients I just don’t have (think exotic spices that I refuse to buy an entire bottle of to only use once). So here is MY recipes, which is probably a combination/modification of no less then three other recipes. Heat Oven to 400, Mix Ingredients, spray muffin pan with Pam or Smart Balance spray, makes 16 to 18 muffins divided evenly in muffin tins (you can sprinkle a little brown sugar or cinnamon on top if you wish), bake for 20 minutes or until a toothpick inserted in center comes out clean, cool in pan for 5 minutes than place on wire rack to cool completely. The result a very healthy (no butter, no salt, no oil, no whole eggs) muffin sweetened by low glycemic agave rather than all sugar. I actually think the agave made the muffins extra moist. I am used to baking with no butter, salt, or whole eggs so it may taste a little different to someone who is not which is why I included those ingredients above. Overall I was VERY happy with the result and look forward to using agave in many more dishes to come! Working mind, body and soul, faster, harder, stronger, longer.